Okay, let's just file this True Story under "Over-Indulgent Parents": I know a mom who took her two children on a surprise trip to Disney World, but bought all of their Disney stuffed animals, "mouse ears", and princess costumes before the trip (secretly packing an extra suitcase), because she knew the same toys would be marked up inside the theme park and she didn't want to disappoint the kids by saying "no" to the souvenirs. I know she meant well, but it would seem (to me, anyway) that the plane tickets, the hotel room, the rental car and the gas, three restaurant meals and snacks each day for two parents and two kids, and a week's worth of park admission tickets to Disney World (have you seen those Disney ticket prices lately?) are more than enough of a gift to the kids, without throwing in a suitcase full of souvenirs that were probably all made in China. Keep a trip journal--online or traditional spiral-bound. Even better, have your kids write some entries. Make a sketch. Or have your kids draw or paint a picture of your family on the trip. Frame it or just hang it with a magnet on the fridge. Take photos, and lots of them--it's so easy in the digital age to snap away. You can (and should) edit ruthlessly later. 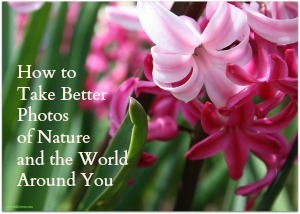 Let your kids snap some photos--their viewpoints are priceless. Plus, how else are you going to get pictures of yourself on the vacation? Free from the beach: The "perfect" stone; some pretty shells; a handful of pure white sand to keep in a recyled glass jar, labeled with the beach it's from. Ask the waiter if you can have a recipe from the chef (or at least the gist of it) and recreate the dish at home. On the final night of our life-changing, two-week trip to Israel last year, my mother-in-law gathered our extended family--all eleven of us--in one of our hotel rooms and passed out a little informal survey, asking things like "What was your favorite meal on the trip? ", "What was the most exciting thing you did? ", "What did you learn about the country? ", and "What was the funniest moment of the vacation?" Truth be told, the idea seemed a little corny at first, but you know what? It was so much fun to go around the circle and collectively remember our thoroughly amazing trip. Mental mementos: They're free, 100% green, perfect for sharing, and best of all, they don't take up any suitcase space! Your turn: What's your favorite souvenir from a vacation--and was it purchased, created, or found? Are you able to avoid the magnetic pull of the souvenir shop? Please share in the Comments section below. If you are reading this post via email subscription or mobile device, click on the title or go to www.JoyfullyGreen.com from a computer to see the comments and leave one of your own. Click HERE to "like" Joyfully Green on Facebook, where you'll receive new posts first, plus the latest green news. If you enjoyed reading this post, would you kindly choose a way to support this blog? Subscribe via RSS reader or email (under "Categories"). If you choose to purchase any of the products linked here from Amazon, please click through the link to do it. Last but not least, please share this post. Your turn: Is the balance between your work and your personal life out of whack? Or do you keep your priorities in check when it's within your control to do so? Please share in the Comments section below. If you are reading this post via email subscription or mobile device, click on the title or go to www.JoyfullyGreen.com from a computer and you can leave a comment at the original post. (c) 2013 by Joy Sussman/JoyfullyGreen.com. All rights reserved. Photos and text digitally fingerprinted and protected by MyFreeCopyright.com. Site licensed by Creative Commons. Big News: Joyfully Green is Hitting the Road!